What is amox tr-k clv? Amox tr-k clv is a name of a drug which consists of a combination of two drugs: amoxicillin and clavulanate potassium (clavulanic acid) and belongs to the penicillin group of antibiotics. It is more commonly known as Co-Amoxiclav and the popular brand name for amox tr-k clv is Augmentin. This medicine is a prescription product which is utilized in treating the bacterial infections by directly inhibiting the growth of the organism. Amoxicillin is the antibiotic portion in this combination. As the organism can easily develop resistance against this class of antibiotics, the clavulanic acid in form of clavulanate potassium is added to protect against bacteria which may show resistance to amoxicillin. Drug class: This molecule belongs to the group of organic compounds that are know as penicillin which are organic compounds with the the penicillin core structure. Peniccilins are structurally characterized with a a penam ring bearing two methyl groups at position 2, and an amide group at position 6. Drug class: This molecule belongs to the group of organic compounds which are known as alpha amino acids and derivatives in which the amino group is attached to the atom of carbon immediately adjacent to the carboxylate group (chemcally alpha carbon), or a derivative thereof. What are the different dosage forms and strengths available for amox tr-k clv? This combination of drugs is manufactured in different dosage forms with the purpose of improving compliance in the patients. Chewable tablets ate manufactured as 200 mg/28.5 mg, 400 mg/57 mg.
Powders (for oral suspension) are manufactured as 200 mg/28.5 mg per 5 ml and 400 mg/57 mg per 5ml. What are the indications for using amox tr-k clv? How does amox tr-k clv exert its action? Amoxicillin is a beta-lactam antibiotic and is bactericidal in nature. Its mainly acts on the third and fourth (or last) stage of the synthesis of bacterial cell wall membrane. This is done by binding to certain specific proteins which are known as penicillin-binding proteins (PBPs) and are located within the bacterial cell wall. Amoxicillin in a similar way as that of other beta-lactam antibiotics, interfere with the cell wall synthesis causing the lysis of the cell wall. This lysis of bacterial cell wall is mediated by some autolytic enzymes known as autolysins. There is no evident link between the PBPs and autolysins, however, it is likely that amoxicillin can get in the way with an autolysin inhibitor. Whereas, on the other hand, clavulanic acid is also a beta-lactam agent which behaves as a competitive inhibitor of a variety of plasmid-mediated or chromosome-mediated bacterial beta-lactamases. 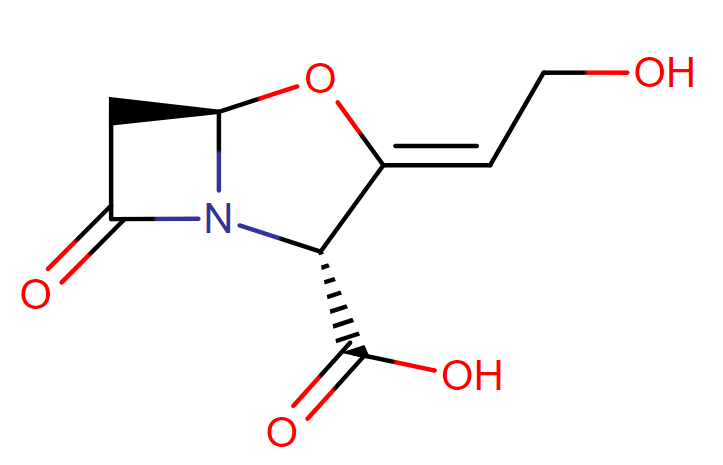 The clavulanic acid in this combination halts the movement of beta-lactamase type I – VI. It attaches itself to the active sites on the enzymes leading to the inactivation of beta-lactamase enzyme. A rapid penetration of clavulanic acid within the cell wall causes the inactivation of the enzyme-substrate complex. This also inactivates the enzyme beta-lactamases which are present extracellularly. Clavulanic acid itself is a weak antibacterial agent and do not modify the actions of any concomitant beta-lactam drug administered. What are the pharmacokinetics of amox tr-k clv? Amox tr-k-clv contains a combination of two drugs amoxicillin and clavulanate potassium which is administered via oral route in form of oral suspension, tablets, chewable tablets and extended-release tablets. Both of these components show different pharmacokinetic parameters within the body. Amoxicillin approximately shows 18% protein binding and clavulanic acid shows 25% protein binding. Both of these drugs present in amox tr-k clv shows a rapid and wide distribution in many tissues and fluids throughout the body. These tissues include lungs, liver, gallbladder, prostate, urine, middle ear effusions, maxillary sinus secretions, synovial, pleural, bronchial, and peritoneal secretions. Only a minute amount of drug is penetrated into the blood-brain barrier when the meninges are inflamed. During meningitis, the drug penetration increases. Amox tr-k clv also crosses the placenta. About only 10% of amoxicillin is metabolized to inactive metabolites and the remaining major fraction of the drug almost 75 – 85% is eliminated from the body as the parent drug. Amoxicillin along with its inactive metabolites is principally eliminated through urine by the mechanisms of glomerular filtration and tubular secretion. On the other hand, clavulanate potassium is eliminated from the both through renal and nonrenal pathways. Via kidneys, approximately 25 – 50% of the drug is excreted. Even though no exact mechanism has yet been studied but the drug shows extensive metabolism. Both components present in amox tr-k clv have been detected in the breast milk. When the renal functions are normal, the emanation half-life of amoxicillin is reported to be 1.3 hours and clavulanic acid shows a half-life of about 1 hour. Both the drugs are stable in the gastric medium of the stomach and show a rapid absorption in the gastrointestinal tract. About 75 – 90% of amoxicillin dose is absorbed. After oral administration of amox tr-k clv in any dosage form, maximum plasma concentration levels of amoxicillin is obtained within 1 hour and for clavulanic acid, it is obtained within 2.5 hours. Improved absorption of amox tr-k clv is seen when administered with food, however high-fat meals reduce the absorption of clavulanate potassium. What are possible side effects of amox tr-k clv? Every drug or combination of drugs which is manufactured for the purpose of treatment is also associated with a number of side effects. However, these side effects are not reported in 100% of the population who was using the drug, only a portion experiences these unwanted effects. What is the recommended dosage of amox tr-k clv? This preparation is available in form of tablets, oral suspension and in form of chewable tablets. It can be administered to the patient without meals but when given with meals the absorption is enhanced and an improved clinical outcome is obtained. The normal recommended dose of amox tr-k clv is one tablet of 500 mg/ 125 mg two times a day or one tablet of 250 mg/125 mg amox tr-k clv three times a day. In severe respiratory infections, it is advised to raise the dose up to one tablet of 875 mg/125 mg of amox tr-k clv two times a day or one tablet of 500 mg/ 125mg three times a day. In those adult patients who have trouble swallowing, amox tr-k clv suspension can be advised. The strength of the suspension can be substituted with that of tablets. Suspensions having strength of 125 mg/ 31.25 mg per 5 ml and 250 mg/ 62.5 mg are a substitute for the tablet of 500 mg/ 125 mg.
whereas suspensions of 200 mg/28.5 mg per 5ml and 400 mg/57 mg per 5 ml can are substituted with tablets of 875 mg/125 mg of amoxicillin and clavulanate potassium. However, it is important to note that 250 mg/125 mg of amox tr-k clv tablet should never be substituted with 250 mg/62.5 mg. This is because of the difference in the amount of clavulanic acid present in these dosage forms. Dosing should be decided on the basis of the amoxicillin portion in the oral suspension. In neonates and infants younger than 12 weeks (less than 3 months), the normal recommended dose of oral suspension of amox tr-k clv is 30 mg/ kg/ day two times a day. A maximum dosage of 200 mg/ 28.5 mg per 5 ml can be given to children of this age. In infants younger than 12 weeks and older children, it is suggested to give this medicine 2 times per day. The suspension of 200 mg/28.5 mg per 5 ml and chewable tablets of potency 200 mg/ 28.5 mg can be administered. Are there any dosing consideration required for amox tr-k clv? Those patients who are already suffering from any kind of hepatic illness should be prescribed amox tr-k clv with caution. This drug is responsible for directly affecting the liver enzymes when used in high doses so a constant check is required on the liver function tests during the course of therapy. However, no guidelines are yet established regarding any dosage modifications to be made. In patients, where there is an evident renal impairment amox tr-k clv tablets of higher potency is strictly prohibited. Moreover, extended release dosage form of amox tr-k clv should not be prescribed to patients who have a creatinine clearance of 30 ml/min or below. In such a condition dose should not be given more than 250 – 500 mg PO of amoxicillin fraction two times per day. In children and adults who weigh greater than 40 kg, the dose of amox tr-k clv is modified but it has been seen that no change in any of the pharmacokinetic parameters occurs until creatinine clearance is below than 10 ml/min. In such a condition, the dose of amoxicillin fraction should be more than 250 -500 mg PO given once a day. This combination of amoxicillin with clavulanic acid as amox tr-k clv is classified in class B of FDA pregnancy risk category. According to studies conducted on animals, it has shown no teratogenic effects. On the other hand, for use in humans, no sufficient data is available on the safety and efficacy of amox tr-k clv. Amoxicillin is, however, to be used with care in pregnant females. On a general amox tr-k clv is considered to be a safe drug for use but according to a study conducted those women who had experienced a premature break of the fetal membranes had been using amoxicillin: clavulanic acid particularly if used prophylactically for any infection. It was assumed that the breaking of the fetal membranes was linked to the increased chances of necrotizing enterocolitis taking place in the neonate. According to the manufacturer of amox tr-k clv, it is advised to use this combination of drugs with great caution in the nursing mothers. In general, breastfeeding the infants whose mothers are using amox tr-k clv is considered to be safe until the infant is himself hypersensitive to penicillin. According to the guidelines laid down by the American Academy of Pediatrics, amoxicillin itself was marked attuned with the breastfeeding yet on the other hand combination of amoxicillin with clavulanate potassium has not undergone studies for safety and efficacy. Only a small quantity of amox tr-k clv was detected in breast milk. According to a study conducted, it was observed that less than a half population of breastfed infants suffered from any unwanted effects whose mothers were using amox tr-k clv. These side effects included irritability, rash, constipation or diarrhea and rarely a rise in hepatic enzymes. In some of the breastfed infants, candidiasis of a mild degree was also seen. These adverse effects were mostly dose-dependent. Serious and drastic anaphylactic reactions have been documented in patients who are using beta-lactam antibiotics even on using amox tr-k clv. People who have a past medical history of hypersensitivity reactions on using penicillins or/ and have been sensitive to various allergens are at a higher risk of being sensitive to amox tr-k clv. Before the treatment with any dosage form of amox tr-k clv is recommended, a complete patient profile is required. In the case when there is no doubt and on starting the treatment with amox tr-k clv, hypersensitivity reaction occurs, it is necessary to immediately discontinue the medicine and provide any symptomatic treatment for management purposes. On using a number of antibiotics, the occurrence of Clostridium difficile associated diarrhea occurs. When amox tr-k clv is used, CDAD has been documented whose severity can vary from placid diarrhea to life-threatening colitis. The possible mechanism behind this unwanted effect is that these antibiotics change the usual flora of colon proceeding to excessive growth of C.difficile. This organism produces toxin A and toxin B which is responsible for the development of CDAD. It is recommended in general clinical guidelines, that CDAD must be considered in all those patients who are complaining of diarrhea after using antibiotics. When this condition is confirmed the ongoing therapy with the antibacterial agents should be discontinued. Protein supplementation, fluid, and electrolyte replacement are advised as the treatment along with the appropriate antibiotic. In extreme cases, colectomy is required. When amox tr-k clv is prescribed, without the regard in which dosage form it is prescribed, in the absence of confirmation of any strong infection it will provide no advantage to the user. However, on the usage of amox tr-k clv in such a condition, chances are increased for the growth of a drug-resistant organism. The interaction between amox tr-k clv and typhoid vaccine is reported as a major interaction. Antibacterial agents which act against bacteria such as Salmonella typhi can interfere with normal immunological reactions that occur as a result of live typhoid vaccine administration. A time gap of minimum 24 hours should be provided between the last administered dose of amox tr-k clv and the typhoid vaccine. A moderate degree of drug interaction has been reported been warfarin and a number of antibacterial agents including amox tr-k clv. A rise in INR is observed which is associated with a higher risk for bleeding. A possible mechanism behind the bleeding can be associated with the inhibition of vitamin K production. When amox tr-k clv is given, there is an alteration in the normal flora of colon. These changes in the normal flora along with a rise in INR together contribute to bleeding. It is suggested to closely keep a check on patients for the occurrence of any signs of bleeding. Observing INR just before the treatment is started with amox tr-k clv and upon the discontinuation of amox tr-k clv is mandatory.